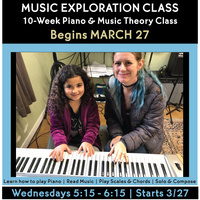 The objective of this 10 week, 10 class course is for students to feel confident with a basic grasp on piano, music theory, understanding intervals, and how scales & chord progressions work. By the end of this course, students will be able to improvise in several different major and minor keys as well as being able to identify chord progressions that work with these keys. They will compose chord progressions for their improvisations. Students will learn how to read music notation and other musical symbols and terms needed for the first 2 years of study on any musical instrument. Students will learn up to 5 beginning classical, modern & blues songs, which will allow the student to learn how to solo/improvise.